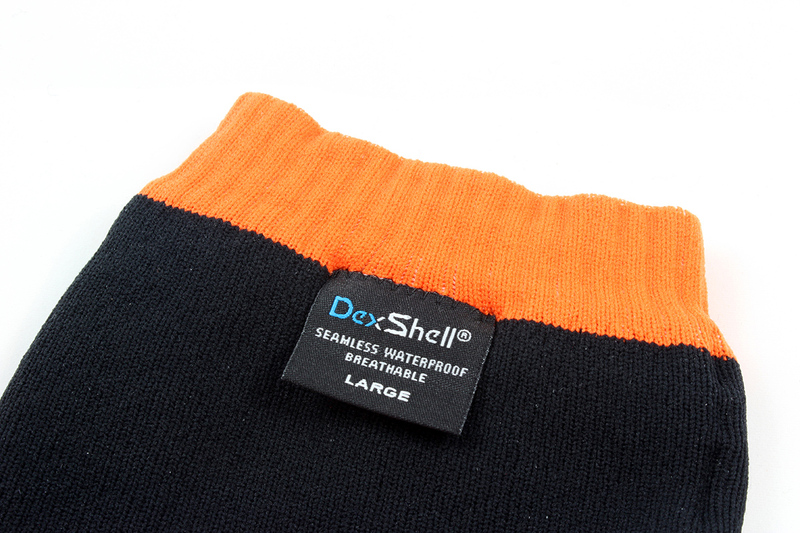 DexShell is a relatively new player in the breathable waterproof apparel market, currently offering a variety of waterproof socks, gloves, and hats. 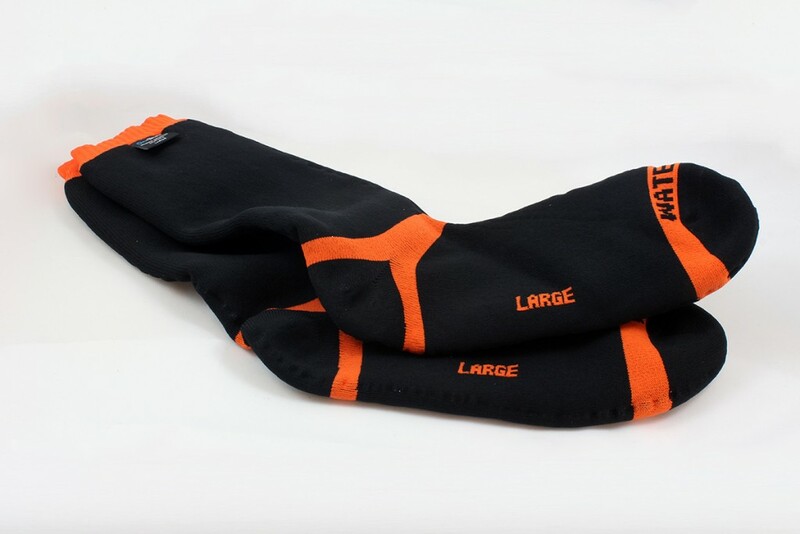 With cold weather possible and wet conditions guaranteed, I purchased a pair of DexShell Hytherm Pro Socks to use on a recent trip to the Pacific Northwest. 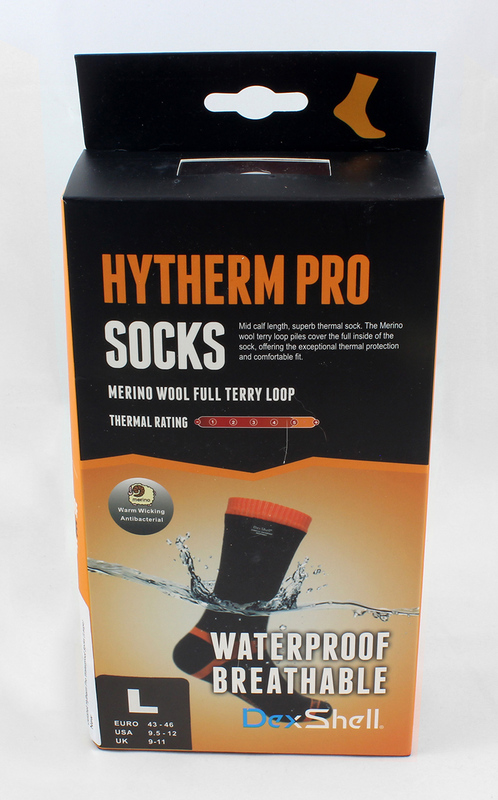 Available for just under $40, the Hytherm Pro socks are priced very reasonably in comparison to equivalent products. Waterproof hiking socks are the subject of one of many endless debates regarding hiking gear, and their use is mainly a personal preference, especially in above-freezing conditions. Forecasts in the weeks approaching my late-April hike in Olympic National Park indicated that morning temperatures would be around freezing, and highs during the day could be anywhere from the mid 40’s to 60’s Fahrenheit. Rain in some form seemed all but certain. With the potential to be hiking in cold, rainy conditions with intermittent river crossings, I searched for some warm waterproof socks to bring. This was a conservative gear choice since I had never hiked or camped in the Northwest. Note that within the scope of waterproof products, “breathable” is relative term. 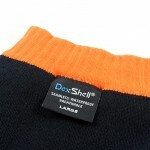 Breathable waterproof fabrics/films/layers such as eVent and Gore-Tex allow some perspiration to exit the garment, but by no means will they be breathable like a lightweight merino or synthetic shirt – some dampness or wetness will be present. This is inherent issue with restricting airflow and free evaporation, and no problem with the layers themselves, per se. 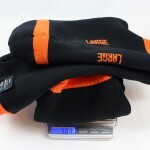 With this in mind, I decided to bring waterproof socks to ensure warmth in cold, wet conditions when my regular merino socks were not likely to dry out. 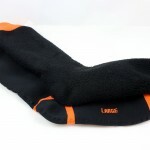 I began looking for breathable waterproof socks by searching for Gore-Tex, a common go-to for waterproof outdoor apparel. Selection wasn’t spectacular, but DexShell products popped up on the same Amazon search and caught my eye. They looked very comfortable, were backed by a number of positive reviews spanning a few months, and the price was certainly right. 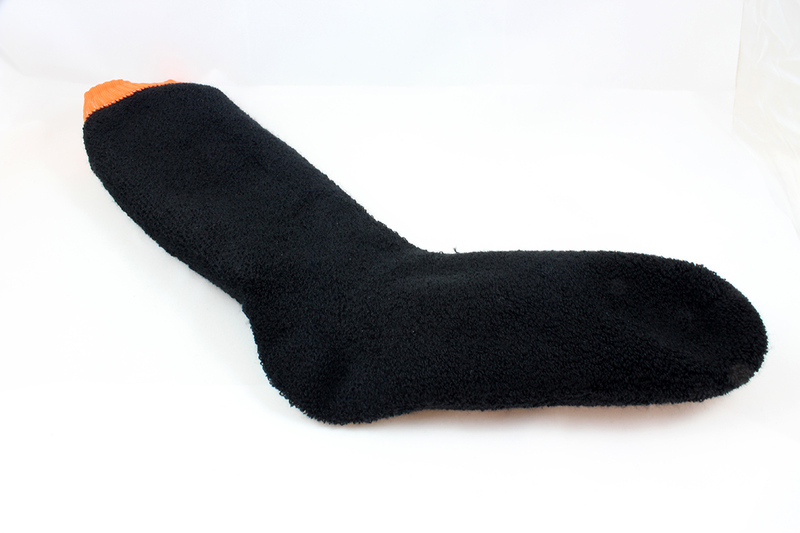 I went with the Hytherm Pros, DexShell’s warmest sock. 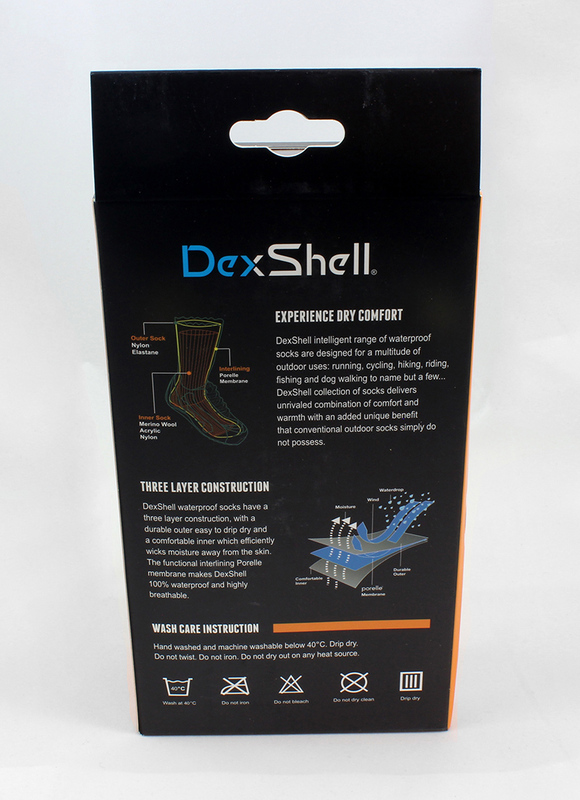 DexShell’s Hytherm Pro Socks consist of three layers: an inner sock, a waterproof membrane, and an outer shell. 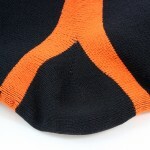 The inner sock consists of 40% merino, 40% “anti-piling acrylic” (exact composition not specified), and 20% nylon. 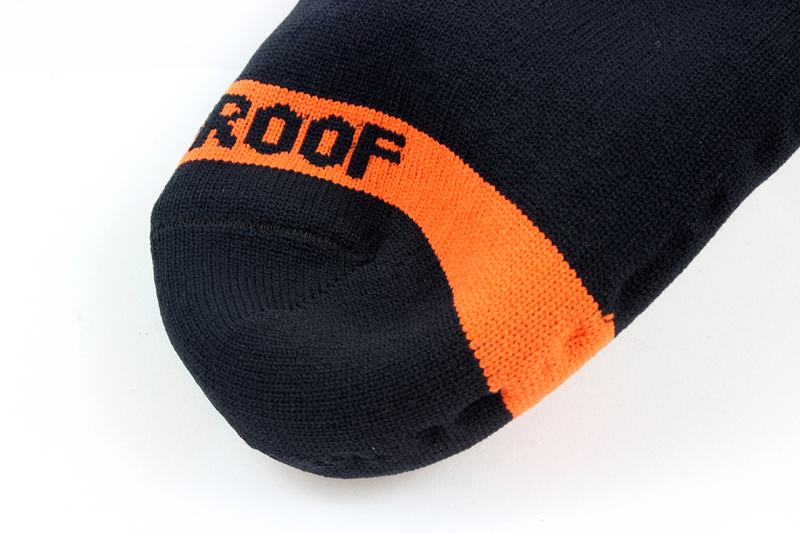 A Porelle membrane between the inner sock and nylon/elastic outer shell provides waterproofing. 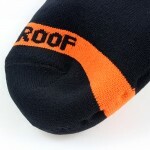 Straight out of the box, the socks appeared well-stitched and felt soft, thick, and comfortable. 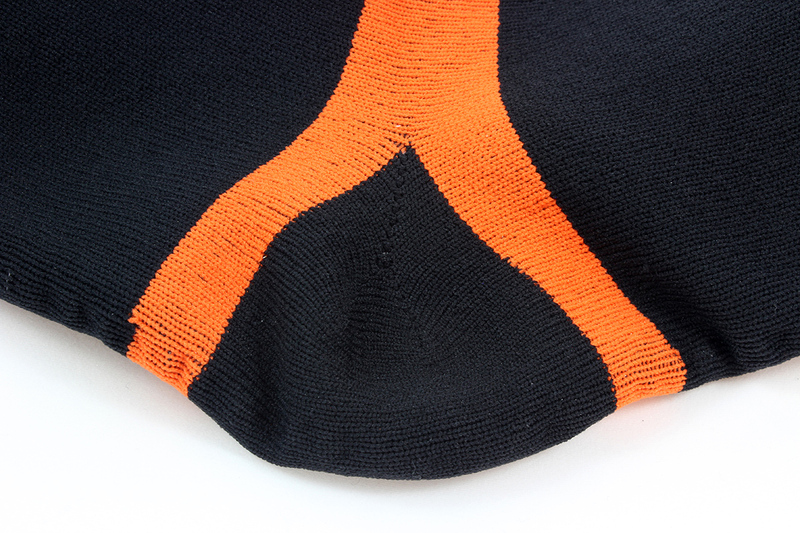 The merino blend for the interior felt quite plush. 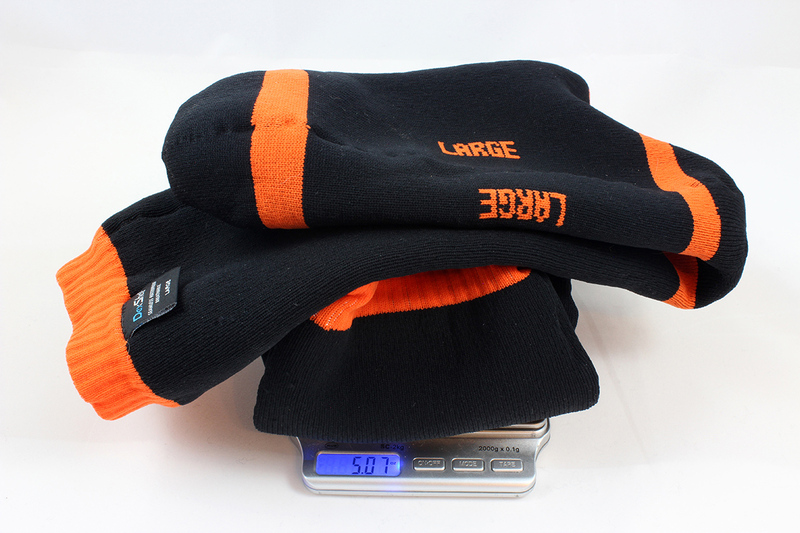 However, at a weight of 5.07 ounces for a size large, these socks would need to be considered essential gear to make it into an ultralight hiker’s pack. For a rough test, I filled the bath tub about 6 inches of cold water, put the socks on, and stood in the tub for about two minutes. I then walked in place for another minute to see whether the motion or pressure would reveal any leaks. I felt coldness through the socks a couple seconds after standing in the water, but no wetness. Both my feet and the inner sock were dry after this little test. When it came time for the hike, we got extremely lucky with the weather – sunny and in the 60’s. 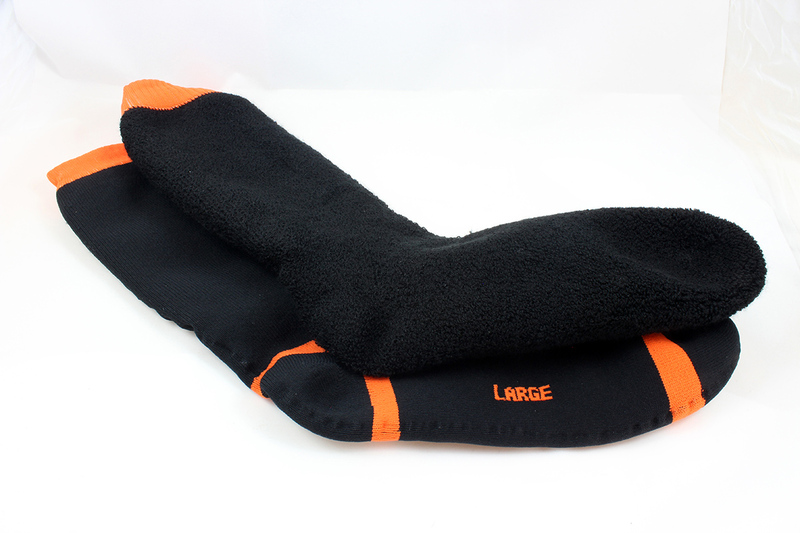 I used my regular merino socks for the 6 mile hike to Elip Creek camp – this would serve as my baseline and allow me to determine whether waterproof socks would even be necessary on this particular hike. Most stream crossings resulted in a brief, partial dip into cold water, but Wild Rose Creek afforded no such luxury. I couldn’t find a suitable dry crossing after 10 minutes of searching, so straight across I went. Upon arrival at camp, both my socks and trail runners were wet and took a long time to dry out by the fire as the sun had set in the valley and the temperature was dropping. Wild Rose Creek was about a mile before the campsite, so I did not have to hike an extended distance in very wet socks/shoes. However, the return trip the next morning would mean crossing the river early in the hike with temperatures in the low 40’s. So, I decided to wear the DexShell Hytherms on the return trip. The socks proved to be warm and comfortable in the morning prior to hiking, with ample cushioning all around. Pulled up, the Hytherms extend about 12” up from the heel, which made for easy crossing at Wild Rose Creek. Using submerged rocks to stay as high in the water as possible, the water never got over about 6” up the sock. At the other side, my shoes were soaked, but my feet were dry. I continued the hike in the socks as the outside temperature continued to rise. Once back at the trail head, my feet were damp with sweat, but certainly no worse than on the hike out. A 45 minute drive with heat cranked up on the car’s footwell dried my shoes and the Hytherms out pretty well – nothing worse than a slight dampness due to continued sweat by wearing thick socks with the heat blasting. In short, I was satisfied with their performance. 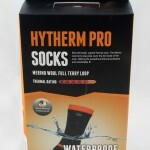 Overall, I liked the DexShell Hytherm Pro Waterproof Socks and would recommend them for anyone seeking a thick, warm, waterproof sock. I had no complaints, and could find no fault with the product during my test. However, long-term durability is yet to be seen. 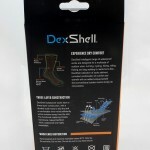 For warmer conditions, DexShell does offer thinner options such as the Coolvent and Coolvent Lite – I would certainly consider purchasing a pair for use in warmer weather if waterproof socks were necessary.